The History of Tin Glazed Pottery Ceramics. The manufacture and examples. Tin glaze ceramics, normally earthenware, known also as delftware or delft, was the first white pottery manufactured in England. Tin glaze is a clear lead glaze to which tin-oxide is added in a proportion of approximately 1:3. Tin Glaze Ceramics were very popular because they resembled Chinese porcelain. The new Chinese porcelain was very expensive and only the wealthy could afford to buy. The usual characteristics of tin glaze ceramics are a white surface, due to the mixing of tin oxide in the glaze. A method used in the middle east, since the 9th century. and then by the Spanish during the 13th century for elaborate luster wares. The use of tin glaze spread throughout most of Europe in the following centuries and both Holland and England became centres of tin glaze ceramics production in the 16th and 17th centuries. By the 1650s, the majority of well known potters in England were Flemish or Dutch, and ideas for decorations had been borrowed from Italian or Oriental painted pottery. Eventually, English craftsmen established their own tin glaze potteries and began to claim they could imitate dutch or chinese wares. Although 17th-century tin glaze potters depended chiefly on the country gentry and mercantile classes for business, it did not keep them from responding to changes in taste and fashion. Antique Tin Glazed Pottery Ceramics. Tin-glazed earthenwares are also referred to as delft, majolica, or faience. The various names asscoiated with Tin Glazed Ceramics originate in different countries and reflect the historical evolution in which tin-glaze techniques grew and passed person to person and area to area. Tin Glaze is thought to have originated in the Middle East about 1100 years ago. The Spanish Moors introduced it to Europe and began producing Hispano-Moresque wares. In Italy tin glaze pottery was called Maiolica, after the island of Majorca from where Hispano-Moresque pottery was exported. German, French and Scandinavian Tin Glaze ceramics are called faience or fayence after the Italian pottery centre at Faenza. 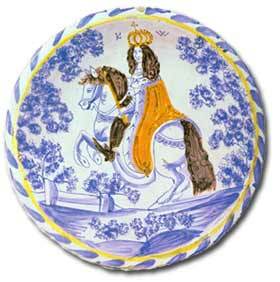 Dutch Delft and English Delftware are derived from the Dutch name for Tin Glaze Ceramics. The earliest tin-glazed pottery in the Netherlands was made in Antwerp by Guido da Savino in 1512. The use of marl, a type of clay rich in calcium compounds, allowed Dutch potters to refine their technique and to produce much finer ceramics. 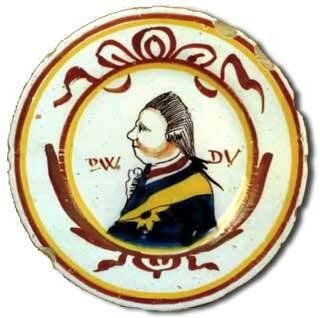 Delftware was a blend of three natural clays, one local, one from Tournai and one from the Rhineland. From about 1615, the Dutch potters began to coat their pots completely in white tin glaze instead of covering only the painting surface and coating the rest with clear glaze. English delftware is harder and coarser than the softer, thinner Dutch Delftware. From c1720 English delftware became more distinctive and was less intricately decorated. Delftware produced in the 17thC tended to be delicate with some Brisol produced exceptions. A larger range of wares were produced and included; wall pockets, punchbowls, plates, plaques, wine-bottles, guglets, puzzle jugs, tea and coffeewares, fuddling-cups and posset-pots. Many of these were decorated with contemporary British subjects while others were decorated in blue and white chinoiserie themes. Production of English delftware virtually ceased at the end of the 18th century due to increased competition from Wedgwoods creamware. Queens Ware was an enormous success and spread the name of Wedgwood across all of Europe. Today Queens Ware is highly collectable and very affordable. Majolica is a name coined in the the late 19th Century for relief moulded pottery decorated with coloured translucent non-tin glazes. It was mainly produced in England and North America with some limited production in France. The style echoed the colourful creations of the Della Robbia family in 15th and 16th Century Italy. 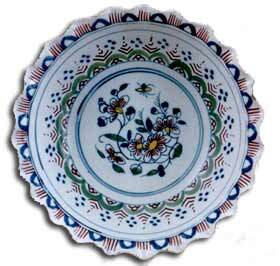 Majolica wares include Italian, Spanish and Portuguese ceramics. Maiolica, however is Italian tin-glazed pottery dating from the Renaissance. It is decorated in bright colours usually on a white background and frequently depicts historical, mythological or legendary scenes. Identifying tin glaze ceramics and their value. Tin glazed earthenware can be identified by its brittle glaze and its tendency to chip easily. It differs from a porcelain body as the clay is grainy and its colour is quite different to the colour of the glaze. 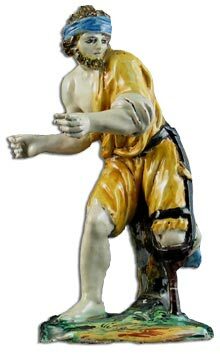 Antique collectors will struggle to find a genuine piece of antique tin glaze earthenware that does not have chipped edges. Tin glaze ceramic decoration varies greatly as does the value of pieces originating from different areas. Tin Glaze Ceramics to Collect Hispano-Moresque pieces dating to the 15th Century and probably made for Florentine Nobility are the most sought after and achieve the best prices at auction, while an 18th Century English Delftware blue and white plaque may struggle to sell for more than £100.